Bal Thackeray became a cult in his lifetime. Does Thackeray show this picture of him? Yes, it does, feels Utkarsh Mishra. There are two types of people who know Bal Keshav Thackeray: Those who call him Bal Thackeray and the others who call him Balasaheb, or simply Saheb. The former would never make a movie on him. Nor would they like a movie made on Thackeray's life and politics. The latter would love a Thackeray biopic. And if they made one, it was bound to be hagiographic. Even the hagiographic ones would be of two kinds: One that show an augmented picture of the leader, or as they say, an 'image makeover exercise'. And the other that revealed a truer picture of him and still be proud of it. Thackeray falls in the latter category. Of all notable politicians who made a mark on the national level, Thackeray was the only one who never sugarcoated his views. He openly admired Hitler and vied to be one. He never denied that his partymen indulged in violence and vandalism, albeit calling it a 'reaction of some action'. He often said he did not believe in Indian democracy. Despite such declarations, or perhaps because of it, he had a huge fan following. Many Shiv Sainiks consider him their god. So what do you do with such a character? One who admits to all the views he holds and deeds he does and says this is what is correct, and not what you are taught by 'this system'. Such a person is certain to acquire a huge fan base. Does Thackeray show this picture of him? Yes, it does. To a large extent. Apart from showing Shiv Sainiks rioting and beating and creating a ruckus -- of course, as 'reaction to some unjust action' -- one 'moment of admission' in the movie is the part showing the killing of Communist Party of India MLA Krishna Desai who was stabbed to death on June 5, 1970. The movie opens with Thackeray's trial in a Lucknow court. When he enters the courtroom, even the judge feels the urge to stand up, but soon realises that he is the judge. So the questioning proceeds and the movie keeps going back into Thackeray's past, cutting to the courtroom at regular intervals when he has to justify his deeds and decisions and those of his partymen. Most of the flashback scenes are shot in black and white. One such scene is an attempt on Thackeray's life after which he says that 'red monkeys' need to be taught a lesson. In the next scene, we see Desai killed. Although those arrested for Desai's killing were linked to the Shiv Sena, Thackeray was not charged with any role in the crime. It cuts to Thackeray in his garden, taking care of a marigold plant. And on the black and white screen, a marigold flower turns saffron, symbolic of the colour that would rule Maharashtra many years later. The movie aptly shows how Thackeray was supported by the Congress in the initial days of the Sena because he was against the Communists. It also doesn't hide that he supported the Emergency. Yes, when it comes to violence perpetrated by the Shiv Sena, it is always preceded by scenes where Shiv Sainiks or Hindus are being attacked first, which wasn't always the case in reality. It skims over the March 12, 1993 Mumbai serial blasts and shows it more as a conspiracy to kill Thackeray rather than 'avenging' the post-Babri riots as is popular knowledge. The actors have played their parts well. 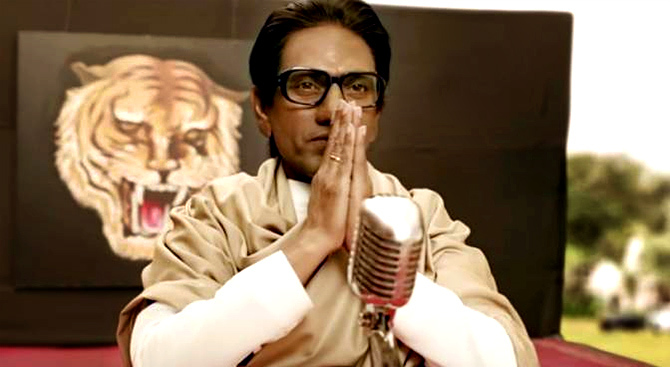 Of course, all the attention was on Nawazuddin Siddiqui as well as Amrita Rao who plays Meenatai, Thackeray's wife. Most of the dialogues where Thackeray is addressing the court or the public are taken from his real life speeches and interviews. The movie is a tale of how a young Thackeray realised that Maharashtrians were oppressed in their own land and went on to build an organisation to 'correct' this system by using violent means whenever required, calling it the real power. He forged political alliances whenever he found them to be useful but gave preference to working among the people. He could tap into people's discontent with his provocative speeches and went on to become arguably the most popular leader in the state, without whose permission nothing could be done. This is what many people like about him and others don't. If you believe there are no excuses for vandalism and violence, then you would not like Thackeray, the leader. And you won't see any point in this movie. But if you are ready to buy the obsolete 'reaction to action' excuse, then, well, clap and whistle when Thackeray says the Babri Masjid demolition corrects a historical wrong. Are you a Movie buff? Get notified as soon as our Movie Reviews are out! How does Anurag Kashyap rate Nawaz's Thackeray? Priya Prakash Warrier winks again! Watch out for Alia-Varun-Sonakshi's Kalank!